The display of PocketBook Pro 612 is made on E Ink electronic paper technology. The distinctive feature of this revolutionary technology is a maximum visual similarity with a paper page: display is not active, only reflected light is used. 6" E Ink® Vizplex display with resolution of 800x600 pixels supports 16 grades of grey that enables displaying complicated texts and illustrations. The PocketBook Pro 612 users experience no such problems as inconvenient view angles or light glares. You can read on this e-reader even in the brightest sunlight. Also, you can switch on a display refreshment mode without fading by activating a proper function in the settings of your reader. A single battery charge provides PocketBook Pro 612 with enough power to read 20 standard books, about 14,000 page turns, or a month of two-hour daily reading. PocketBook Pro 612 has a built-in Bluetooth 2.1 for information exchange. Internet connection is being realized via Wi-Fi 802.11 (b/g). 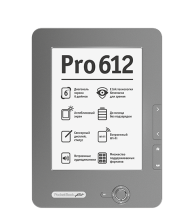 You can operate PocketBook Pro 612 either with the buttons on e-reader’s panel or with a sensor display. PocketBook Pro 612 is based on Linux operation system. Device’s software is being constantly upgraded that allows being innovative in e-reading. 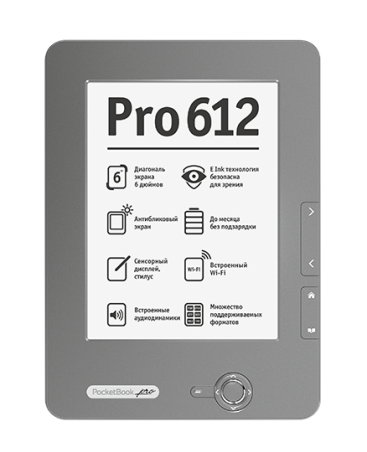 Each PocketBook Pro 612 has 500 free pre-installed books in a number of European languages. Open your e-book’s Table of Contents and the bookmarks and notes that you have created will be displayed.